Legal access to public lands is essential for present and future generations of all recreationists. 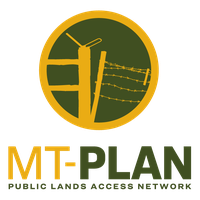 The Montana Public Lands Access Network (MT-PLAN) is a new program to facilitate collaboration among recreationists, private landowners, and land management agencies to enhance public access throughout the state. donation of $1.00 or more will go directly into the MT-PLAN account and help finance easements that improve public access to public lands. Donations can be made here on the DNRC website, or on the websites of Montana Fish, Wildlife & Parks and the State of Montana. Donations made electronically will include a small processing fee. You can also contribute by writing a check payable to the Montana Department of Natural Resources and Conservation. If paying by check, please include “MT-PLAN” in the memo section. Checks should be mailed to Montana DNRC, PO Box 201601, Helena, MT 59620-1601.
or ride. Better access to Montana’s public lands. Montana House Bill 597, introduced by Representative Alan Doane (R) HD 36, passed with overwhelming bi-partisan support in the 65th Legislature and was signed in law by Governor Steve Bullock. The law creates the Montana Public Land Access Network (MT-PLAN) which consists of a voluntary contribution account and grant program administered by the Montana Department of Natural Resources and Conservation (DNRC) to acquire public land access easements and create public access enhancement projects to provide public access to public land for recreational purposes. The bill was widely supported by a diverse range of landowners and sportsmen groups for its innovative approach in using a “carrot instead of a club” to provide incentives for increasing public access across private land to public land that would otherwise be inaccessible. The MT-PLAN grant program is DNRC’s first public access grant program aimed at increasing public access to not only state trust land, but all public land in Montana. It provides a framework for cooperation and coordination among individuals and organizations to enhance public access to our public land. The Montana Department of Natural Resources and Conservation (DNRC) offers grant funding to eligible public access proposals for the acquisition of public access easements or enhancements across private land to inaccessible or difficult to access public land for recreational purposes. The Montana Public Land Access Network (MT-PLAN) is funded by private donations through the DNRC and Montana Department of Fish, Wildlife and Parks (FWP). Donations of $1 or more can be made through department websites, the State of Montana website, an authorized wildlife conservation and combination license vendor, or through direct donations to the DNRC. The DNRC will work with successful project applicants and landowners to negotiate the terms of the access easement or enhancement project. Easements may be for a term no less than three (3) years and up to permanent access in perpetuity. The DNRC will hold and enforce public access easements granted under the MT-PLAN. 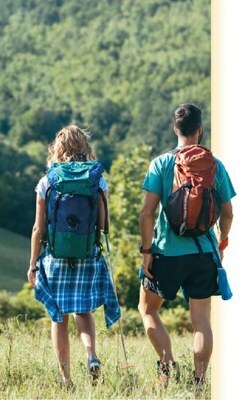 An individual or organization may apply to DNRC for a grant to pay for costs associated with an access project that secures public access through private land to public land as defined in Section 15-30-2380, MCA for which there is no other legal public access, or to enhance existing access to public land. The costs of the grant must include payment to the owner of private land who allows public access. Grants may not be made to pay costs associated with litigation related to public access, or to acquire public access easements where public access has been unlawfully restricted or where legal public access is currently contested. Public access easements or enhancement projects are eligible for MT-PLAN if the public land they access are open to general recreational uses compatible with the land the project accesses. Adjacent private land that allows for public access. Public access easements or enhancement projects are not eligible for MT-PLAN if the public land they provide access to are restricted or closed to general recreational use by the land management agency that owns, manages or has legal control of the public land. If the public access easement or enhancement project would provide access to state trust land, as defined in MCA 77-1-101, the easement must provide access for all lawful purposes to the state trust land. Public access easements or enhancement projects may not provide access to a previously inaccessible parcel of land if that parcel is leased state land under Title 77, chapter 1 of Montana Code Annotated, and the lessee is not the landowner granting access to the parcel. Public access easements or enhancement projects may have a term that ranges from no less than three (3) years up to permanent access in perpetuity. A termed easement that is awarded a grant creates no expectation of access after the term expires. The DNRC shall make recommendations to the State Board of Land Commissioners (Board) regarding grant applications received prior to award. A grant must be approved by the Board before it is awarded and disbursed. A public access easement that is awarded a grant must be held and enforced by the DNRC for the duration of the term. The DNRC shall report the details of approved MT-PLAN grants to the legislative auditor. MT-PLAN public access easements or enhancement projects must be made available for the entirety of the year for all general recreational uses compatible with the land. A MT-PLAN public access easement or enhancement project does not convey to the public any right to hunt or otherwise recreate on the private land through which they are allowed to pass to reach public land. The location of the MT-PLAN public access easement or enhancement project will be published on a map located on the DNRC website, and made available to the public for the length of the contract term. The MT-PLAN public access easement or enhancement project area will be signed by DNRC with MT-PLAN signs to identify participation in the MT-PLAN program. Signs must remain in place for the entire length of the contract term. DNRC and successful MT-PLAN applicants will enter into cooperative agreements (contracts) that will outline the terms of the public access easement or enhancement project. Upon execution of the contract, payment will be made to the landowner for the public access easement or enhancement project. Violation of the contract terms may result in DNRC not paying the landowner and/or enforcing the contract with the full force of the law. The costs of the grant must include payment to the owner of private land who provides a public access easement across private land to public land. A landowner participating in the MT-PLAN program will be paid according to the terms negotiated in the contract for the public access easement or enhancement project with the DNRC. Payments received by landowners for easements providing public access to public land are exempt from taxation, according to Section 15-30-2110, MCA and subject to provisions in the Internal Revenue Code. The grant program is funded by private donations to the MT-PLAN account. Donations are collected in a state special revenue account, which is statutorily appropriated. Funding amounts and cycles vary depending on voluntary contributions to the MT-PLAN account. Applications are now being accepted and will be evaluated on a rolling basis. Contact Ryan Weiss, Public Access Specialist at the DNRC via phone at (406)444-5576 or email ryanweiss@mt.gov for application materials.